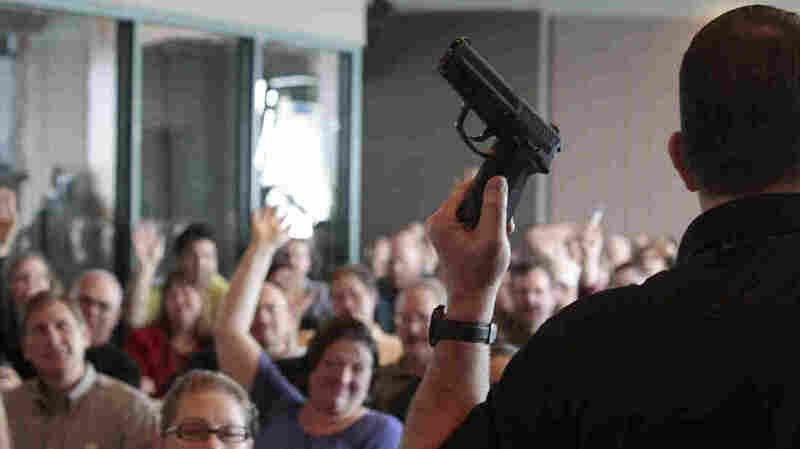 Districts Train Teachers For School Shootings Since the December school shooting in Newtown, Conn., some teachers have been giving more thought to personal safety in the classroom. Over the holiday break, school staff in several cities attended training sessions designed to better prepare them to respond during a school shooting. Firearm instructor Clark Aposhian conducts a concealed-weapons class for teachers, sponsored by the Utah Shooting Sports Council, in West Valley City, Utah. Across the country, school districts and other entities are hoping to better prepare staff to respond in a shooting situation. It's almost instinctive: Teachers want to protect kids in a school shooting. But many don't know how. So over the holiday break, in the wake of the shooting in Newtown, Conn., several districts around the country conducted school shooter training sessions meant to better prepare staff to respond in the event of a similar crisis. Since last month's attack, drills have been conducted in Nashville, Tenn.; Omaha, Neb. ; Utah; and Jefferson County, Ala. In Jefferson County, school staff took turns playing sheriff's deputies and teachers, donning protective vests and dodging wax bullets. Their job: Get the kids to a classroom, lock the door and turn off the lights. From teachers to lunchroom workers, more than 100 school employees participated — five times as many as had signed up before the Sandy Hook Elementary School shootings. The training was chaotic, with people running everywhere and screaming. Teacher Alanna Shankles was amped up upon leaving the Alabama simulation. On a scale of 1 to 10, she rated her adrenaline level a 12. "[It] was like — really and truly like I had people that I was supposed to be protecting. Very, very, very intense," Shankles said. Shankles wanted to participate both as a teacher and as a parent of four kids in the school system. But while an Alabama state lawmaker plans to file a bill to let some administrators and teachers carry guns, Shankles thinks that's a bad idea. "It's scary. I know that I'm an emotionally stable person, but I don't know if the person teaching my son or my daughter is emotionally stable," Shankles says. "And in a situation, you don't know how you're going to react until you're in it. And I don't feel like necessarily teachers should be given that kind of power." Dale Stripling, student services supervisor in Jefferson County, says these kinds of training sessions were once fairly limited. But the Connecticut shootings made one thing clear: Everyone needs to know what to do, from the school secretary to the janitor. "In the old days, we used to just prepare teachers or just administrators," Stripling says. "But now we understand that if a custodian's in the hall and he hears 'code red,' he needs to get out of the hall also. So we try to better prepare all of our employees," should such incidents happen, he says. The Jefferson County training also offered tips, like abandoning the use of confusing codes like "code red." Instead, trainers advocate using plain language, like simply saying there's a shooter in the building. School staffers were also advised not to run at the police in a shooting situation, as police might mistake them for the shooter. The chances of that kind of misidentification happening drop substantially if you're dealing with school resource officers, says Mo Canady, executive director of the National Association of School Resource Officers. That's because those officers know the teachers and the kids, Canady says. Canady says his group has been inundated in recent weeks with requests for this kind of training. He says the difference between school resource officers and armed guards is huge. "When you're talking about an armed guard, you're talking about potentially a security guard — someone hired to stand guard at your front door," Canady says. "When we're talking about the concept of a school police officer, we're talking about someone who is ingrained into that school and that community." And that investment in the community, he says, goes a long way toward feelings of trust and security — a sentiment that's a little harder to come by in schools right now.